Q11. What is the basic unit of a shipboard organization? Q12. List three division officer duties. a. b. c. AIRCRAFT SQUADRON ORGANIZATION Learning Objective: When you finish this chapter, you will be able to Recall aircraft squadron organization to include squadron departments and branch officer. The organization of an aircraft squadron differs in some ways from that of a ship. Standard Organization and Regulations of the U.S. Navy specifies the basic organization required of an aircraft squadron. 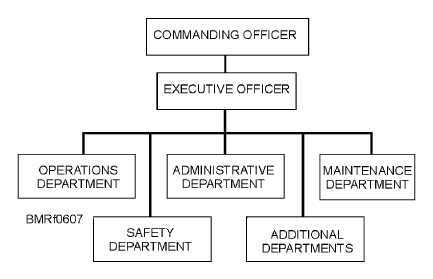 Figure 6-7 shows a standard organizational chart of an aircraft squadron. Look at figure 6-7 again. As you can see, an aircraft squadron has different departments than a ship. This is one of the differences between the organization of an aircraft squadron and a ship. The departments have different names and responsibilities. However, the responsibilities of the commanding officer, executive officer, department heads, and division officers are the same in the organization of an aircraft squadron and a ship. AIRCRAFT SQUADRON DEPARTMENTS All aircraft squadrons have an administrative department and a safety department. Most squadrons also have an operations department and a maintenance department. Some squadrons have one or more departments in addition to the four already mentioned. Based on its mission, the squadron may have a training, a photographic, or an intelligence department. Administrative Department The administrative (ADMIN) department is responsible for all the administrative duties within the squadron. This department takes care of official correspondence, personnel records, and directives. Most of the jobs done by the XOs assistants in a shipboard organization are done by ADMIN in an aircraft squadron. The first lieutenant and command career counselor work as members of the ADMIN 6-12 Student Notes: Figure 6-7.Type aircraft squadron organization chart.